A native of Alliance, William Rush graduated from Alliance High School in 1954 and entered Ohio State University. Before graduating from the Ohio State School of Journalism in 1958, Mr. Rush was active in campus affairs competing on the Buckeye track team and serving as sports editor of the Ohio State Lantern. While attending Ohio State, Mr. Rush worked at the Spectator weekly newspaper group in Columbus as well as the Columbus Dispatch. After working at other newspapers in Connecticut and Massachusetts, Mr. Rush was named general manager of the Lake County (Ohio) News Herald. Besides the News Herald, Rush has held top management positions at four other Ohio newspapers. He has served as publisher of the Lorain Morning Journal, the Warren Tribune Chronicle, the Mansfield News Journal and as manager of the London Madison Press. He also was vice president/general manager of the Troy, New York Record. Since 1990 Mr. 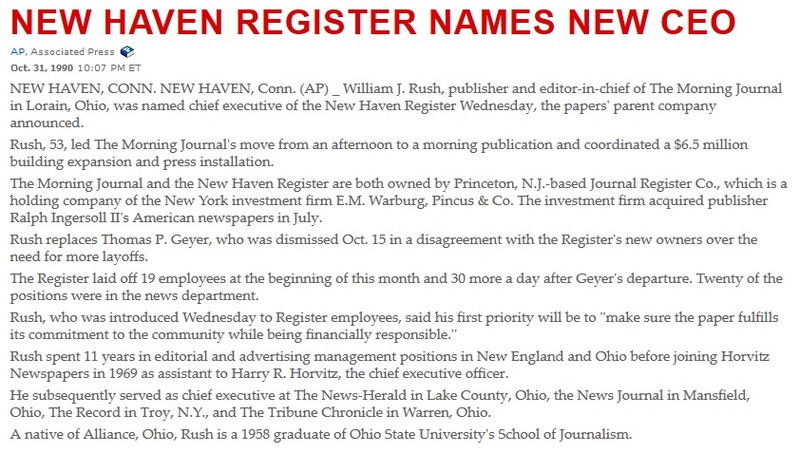 Rush has been publisher of the New Haven Register, Connecticut’s second largest daily newspaper. In 1995 he was made a vice president of the Journal Register Company which publishes 17 daily and 91 weekly newspapers throughout the east and midwest United States. He is currently vice president of the Connecticut Daily Newspaper Association. William J. Rush from the 1954 "Chronicle." Professionally, Mr. Rush has served as president of the Associated Publishers of New York State, has been involved in the printing of USA Today, and served on the Technical Committee of the Newspaper Association of America. Involved in New Haven community affairs, Rush is a member of the boards of the New Haven Regional Leadership Council, Connecticut Public and Economic Council, Long Wharf Theater, University of New Haven, Habitat for Humanity, and Domestic Violence Services. He also is a member of the NAACP, National Company of Military Historians, Honorable Order of Kentucky Colonels and various service and Masonic organizations. Throughout his career, Mr. Rush has taken leadership positions in community service, twice leading successful United Way campaigns in Ohio and New York. His award-winning newspapers have campaigned for good government, civic responsibility and equality for all citizens. In 1995 he was appointed by the Mayor as chairman of a planning committee to organize a new community event called Harborfest. The three-day event, which included a sail-in of tall ships made its debut on July 4-6, 1996 and was huge success. Mr. Rush is married to the former Ruth Ann Lee of East Liverpool, Ohio. They have five children and six grandchildren. Biographical update: Mr. Rush retired in 1998 after a 40 year career as a newspaper executive.